The World Resources Institute’s Sustainability Initiative seeks to align the Institute’s business practices with its mission. Using research and expertise from staff to guide us, WRI is committed to reducing the environmental and social impact of its operations. Walking the talk on sustainability, this report discloses WRI’s 2012 GHG inventory results and discusses GHG reduction projects and other sustainability projects completed in the last year. 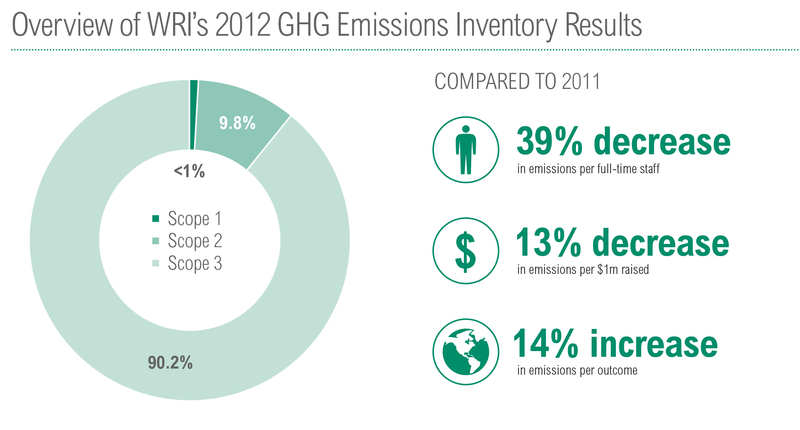 WRI’s GHG emissions decreased 3 percent from 2011 but WRI’s emissions are still 14% above our 2010 baseline. We are making progress in meeting WRI’s 50% electricity target and are 9% below base year. Emissions fell due to reduced office space at WRI’s global office (DC) and improving operational efficiency by shifting cleaning hours. Overall, business travel and purchased goods & services continue to grow. Business travel is still below 2010 levels but has been steadily increasing over the past 2 years. Spending continues to increase for purchased goods and services. Our biggest challenge to meeting our WRI’s 2020 targets is growth. As an organization, we have twice the number of staff we had in 2010 and have experienced a 13 percent compound annual growth in expenses over the past 6 years. Some of our progress in electricity emissions are temporary as our DC office decreased in size in 2012 but has plans to increase total square footage over the next couple of years. Our business travel emissions are reducing per staff member, but the increase in number of staff is currently outpacing our reduction efforts. Additionally, we project a continued increase in sub grants which will continue to increase our scope 3 impacts. With WRI’s large number of new and projected staff, we plan to focus on travel management tools and staff outreach to provide WRI’s staff with the information needed to help manage travel decisions individually and to reduce emissions from necessary trips. Based on scenarios run on potential energy efficiency improvements, we know that energy efficiency alone will not allow us to meet our target and we are looking into purchasing renewable energy in a way that causes new renewable facilities to be built. We plan on expanding our supplier and partner engagement and are considering longer-term approaches to managing our value chain. Climate change creates real risks for business that are already affecting the global economy. These risks are not confined to for-profit companies. To both help WRI mitigate our own risks and to “walk the talk,” WRI set 3 absolute GHG reduction targets in 2010 and is committed to transparently reporting on progress. This report discloses WRI’s GHG emissions from fiscal year 2012 (October 1, 2011 to September 30, 2012) as well as discusses our emissions reductions strategies and non-GHG sustainability actions over the past year. Highlighted in the report is a project engaging directly with our partners - helping them to measure emissions and set reduction targets - as well as collect primary GHG data from our largest suppliers. This provided us with valuable insight as we look to engage further with our supply chain, including what challenges we will need to overcome. In addition to reporting our GHG emissions and trends, our report covers other aspects of sustainability at WRI. These include a nitrogen footprint, a new sustainable events policy, and fiber testing our purchased paper products. 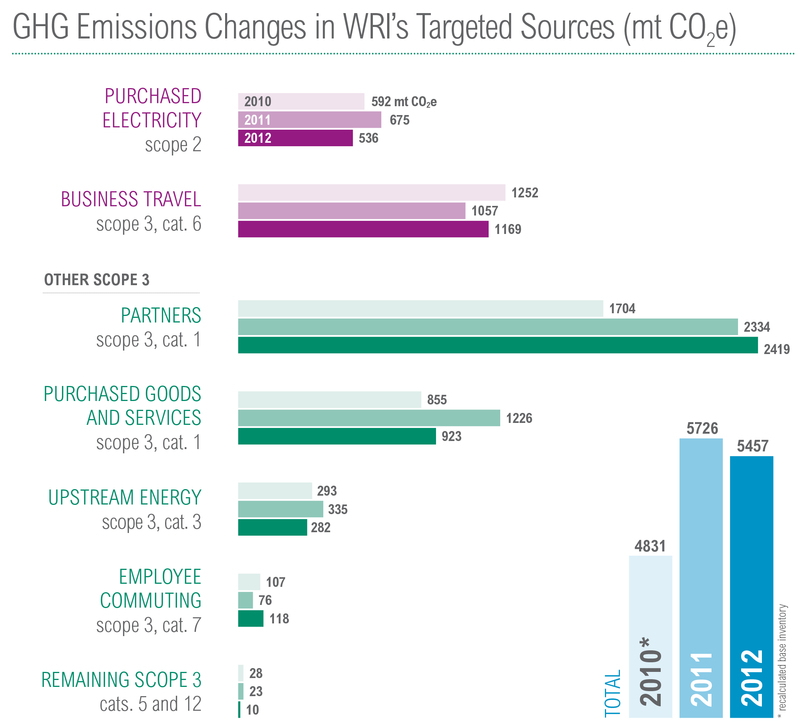 We continue to grapple with the challenge of decoupling GHG emissions from WRI’s institutional growth. We know we are not alone in this challenge and plan to increase the transparency around WRI’s internal sustainability efforts to support partners, NGOs, and companies. We are working to implement new guidelines to help reduce business travel emissions, innovative ways to purchase renewable energy, and paper procurement principles to support sustainable forest stewardship. Extreme weather events, including record-breaking temperatures, prolonged droughts, and powerful storms, are occurring around the world with startling frequency and mounting costs. These often devastating events are just some of the impacts of a global climate that is changing because of anthropogenic greenhouse gas (GHG) emissions. To limit dangerous climate change impacts, global temperature must be stabilized at 2 degrees Celsius above pre-industrial levels—a goal that requires dedicated global collaboration on GHG reductions. As an organization dedicated to protecting Earth’s environment and improving people’s lives, the World Resources Institute (WRI) has long recognized our obligation to reduce GHG emissions in our own operations. 20 percent reduction in emissions from other scope 3 categories. WRI’s 2012 inventory measures 5,457 metric tons of carbon dioxide equivalent (mtCO2e) associated with our yearly value chain (scopes 1, 2, and 3) activities. This is a 3 percent decrease from our 2011 GHG inventory, putting us on the right path toward emission reductions (see figure 1). Our reductions are due mostly to a decrease in purchased electricity (scope 2), in part because of new energy-saving actions, but also influenced by a short-term cut in leased office space. The completion of office renovations before 2012 also led to a drop in emissions from purchased goods and services compared to 2011 levels. However, WRI has grown significantly, with 13 percent compound annual growth in expenses over the past 6 years. Corresponding emissions increases from 2010 to 2011 puts our total emissions still 14 percent above the 2010 base year inventory. To meet our reduction commitments, WRI is identifying and implementing strategies to target reductions in energy use, business travel, and purchased goods and services. This report highlights one such strategy: engaging with our suppliers and partners. This allows us to learn more about their GHG inventories and encourage reporting and reduction targets, which in turn reduces emissions in our supply chain. Through two pilot projects, we learned valuable lessons that will help us move forward; these lessons may also prove valuable to other organizations that wish to engage with their supply chain. Beyond working toward meeting our absolute reduction targets, we continue to quantify and address other sustainability issues. In 2012, we continued to calculate WRI’s nitrogen footprint, increased our understanding of the paper products used in our operations, and reduced the environmental impacts of our onsite events. Moving forward, we intend to continue improving metrics and methodology around our GHG inventory and other sustainability efforts. WRI’s anticipated growth in the coming years will not make it easy to meet our targets. However, WRI is determined to aggressively pursue reductions in our own environmental impact while achieving positive changes in the world and advancing our mission. The World Resources Institute’s Sustainability Initiative seeks to align the Institute’s business practices with its mission. Walking the talk on sustainability, a new report discloses our 2012 GHG inventory results and discusses GHG reduction projects and other sustainability projects completed in the last year.